Darpan School was started in July 1991 with six students, one teacher and only class LKG. And with dedicated efforts, passion for providing good and quaility education, the institution has carved a name of its own in Haldwani today. The school is privileged to have Smt. Minaxi Joshi, a well experienced founder Principal and teacher, Efficiency award winner from U. P. Government, who has been doing her best to maintain the school standard and quality education provided by the School. Sri Girish Chandra Joshi M.A. B.Ed., well experienced, retired teacher with the devoted members of the society has been giving the guardianship to the school from the very beginning. The school is not very far away from the rail and roadways but it is situated far away from the crowd and road side problems. 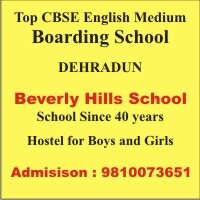 Enough, huge and airy rooms with a small play ground surrounded by trees, well experienced educated teachers, well behaved students, games, co-curricular activity, normal fee structure are some specialties of the school.